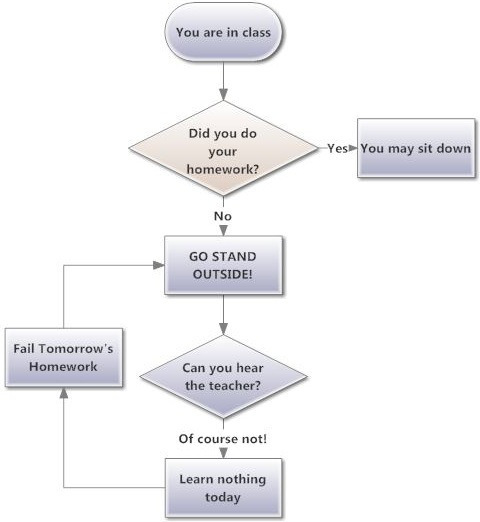 Righty, so the Cycle of Homework Failure, is one that I am familiar with. In my experience, the failure was not so much to do with being outside the classroom during lesson time and missing out on what the teacher was saying, but being inside the classroom during lesson time and missing out on what the teacher was saying. Early on, this was not because I was dreaming or sleeping during class hours, but because the teachers had to choose the speed and level at which they were teaching concepts in class, and they quite often chose to aim ‘in the middle’. This usually meant that while three-quarters of the class were able to cope with the lesson, a quarter of the class would struggle to keep up. Eventually, students like myself would all be so far behind the others in understanding the subject, that we would stop paying attention in class. Although I did not understand my lessons, I am blessed with a pretty good memory and was able to manage to escape tuition in most subjects just by regurgitating reams of information during exam time. Obviously, this meant that my foundation in core concepts was weak. No PSLE? BRING ON THE CONFETTI! When I was in Primary 6, our parents moved to the United States for a whole year, which meant that I missed taking the dreaded Primary School Leaving Examination (PSLE). It would have been the first nationwide standardised test I would have taken at that point. Of course, I was very excited at the prospect of escaping the exam. The PSLE aggregate at the time was used to stream students into different learning levels. The levels are fixed and work only in one direction – if you are weak, you go down a level. That is all. My understanding at the time was that the future would be decided at the age of 11. How stressful is that? When we got to America, I spent a year in 7th grade at a local middle school, located in Montogomery County. This is the grade equivalent of Secondary One. Although I did not have the same learning background as most of the students there, I was able to keep up with the curriculum and pretty soon, I was getting straight As. This was entirely on my own effort, with no tuition or help from parents. This gave me a sense of achievement which I had never yet experienced in my life, and increased my self-motivation and drive for learning independently. Now, there is no streaming process for public schools in America. Students automatically attend the school which is assigned to their home address. This means that the school has to teach a broad spectrum of students with different learning levels. Certain classes (such as Math or English) were split into normal, top, and accelerated levels, each with its own curriculum, and the teachers would recommend that students level-up according to their abilities. The normal curriculum was all one needed in order to progress to high school and later, to college or university. Top and Accelerated-level students would be able to have their high-school work count as college credits should they chose to enter tertiary education. This did not mean that they would graduate from college early – instead, this would give them more flexibility in choosing elective classes at the college level. There was also support available in regular classes for academically-challenged students with mild learning problems (eg. a teaching assistant would be on hand in the classroom for a specific student), as well as separate functional life skills classes specifically for students with very severe learning difficulties who did not participate in the normal curriculum. All students were required to take certain compulsory classes (Math, English, Science, World Studies and Physical Education) as well as a two elective classes which could be a second language class, music, or art. Our class schedule was such: School hours were from 7:55am to 2:40pm. We had seven class periods, each lasting about 45 minutes (excluding lunch and a ‘home’ period where we were allowed to meet with our teachers to get extra help if required). The daily class schedule was fixed, and class sizes were between 30 to 35 students. This meant that our teachers for each subject would meet us everyday and have plenty of time to cover the curriculum. During class time, there was not only time to attend to the needs of the weakest students in class, but also the opportunity to encourage the strongest students in independent study for extra credits. The teachers that I had were active in class and interacted with students more closely. Now, granted my experience in an American middle school is nearly 20 years old, but a quick glance at the school website tells me that the daily school schedule is basically the same. In Singapore, the MOE has guidelines on formal curriculum hours at both primary and secondary level. Our school hours are around 5-6 hours a day including recess time and each lesson period is around 30-40 minutes long. Additionally, our average class sizes are nearly a third larger. Our teachers are instructed to abide by the rule of ‘Teach Less, Learn More’ which limits teachers to five class periods a week per subject. This means that teachers in Singapore have less time to teach a greater number of students. It is no wonder that weaker students eventually fall behind and are quickly overwhelmed by the Cycle of Homework Failure. The only way to escape this would be for students to attend remedial classes (which would be on the teacher’s personal time and is not factored into the school schedule) or receive private tuition. You would think that our teachers have plenty of time to spare, since the number of hours they actually spend in the classroom appears to be reduced. In actual fact, our teachers have a ridiculous workload compared to teachers in the UK, Australia and the US – but that’s another story for another post. At a recent keynote speech the MOE work-plan seminar, Mr Heng Swee Kiat (our Minister of Education) recently announced that the scoring system for PSLE will be changed from an aggregate ‘T-score’, to a broader grade system. Additionally, there will be greater flexibility in secondary school subject offerings and allow students to customise their learning. I’m not sure how these changes are going to be implemented and if this will make any real difference to our education system, but at least the thought is there. I was going to talk about a show I was looking forward to in the future, but I felt that your question about the Ministry of Education’s (MOE) press release on the effects of tuition on mainstream education in Singapore needed more prompt attention, so I’ve pushed back my post in order to address it. I had a very tough time in school. Even today, I find it extremely difficult to think or talk about my school years without succumbing to a combination of anger and melancholy. So, I will try my best to keep this rant relevant, instead of rubbing my PTSD in everyone’s faces. Despite living in Sydney for the last thirteen years, I’ve kept tabs on educational policy in Singapore. I know that the MOE policy changes have included an overhaul of the Mother Tongue Language program and lasting changes to the reserve system for Primary School postings. I have been given to understand that the Prime Minister himself has given a speech addressing his hopes for education reform in Singapore. I like to think that students in Singaporean schools today are having a better time than I did. However, while I’m aware that my experiences are somewhat outdated due to the thirteen year lapse, I feel that my experiences with schooling and tuition are still relevant. The MOE’s claim that the Singaporean education system is run on the basis that tuition is unnecessary is laughable to me, because I do not recall a single Singaporean school year in which I didn’t require some form of tuition. Most years, I could barely scrape by with just Mandarin tuition, but there were some years where I would be shuttling back and forth between no less than three separate tuition centres in order to catch up on work for Mathematics, Science and, in one fateful year, Literature in English. This isn’t to say that I am lazy or stupid. I did manage to get through the Australian Higher School Certificate (HSC) without the need for tuition in subjects that I didn’t have any prior foundation in. I hesitate to say that my teachers in Singapore were lazy or unmotivated either – they may very well have been overworked, what with the class size in my time being 40-45 students strong and having to deal with Co-Curricular Activities (CCAs) on top of that. There is a lot of very current talk about how teachers are overworked and how individual school policies may not necessarily line up with the MOE’s. 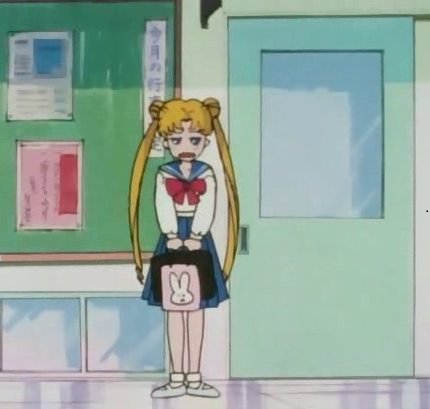 However, I’d like to talk about one of the many reasons why tuition was necessary for me – The Vicious Cycle of Homework Failure, a topic which I have written about briefly on my anime review blog, Becky’s Moonviewing. This means that you are either not actually present in the classroom to learn from the teacher or are too angry/ashamed to learn. If you happen to be good in the subject that you are punished for, you will usually be able to make up for lost time by asking your classmates or your parents to explain the lesson to you. However, if you are bad at the subject you are punished for, you end up unable to do the homework for the missed class and are punished for it the next day… and the next… and the next until you end up spending more time outside the classroom than inside of it. A good teacher will notice this problem right away and nip it in the bud by spending one on one time with you or getting you into a remedial class that will help you get up to speed. To be fair, the MOE’s statement does point this out, but in all my time in Singapore, I can only name one teacher who was passionate enough about teaching to try helping me during school hours. She was a Primary School teacher. Most of the other teachers that I’ve had were either too overworked or too inexperienced to address my difficulties. Additionally, the teacher shortage in Singapore meant that many of my Secondary School teachers were inexperienced recent graduates – newbies still learning on the job. The result? I ended up having to learn basic concepts outside of school, even for subjects that I was purportedly good at simply because I didn’t have teachers who were capable of accommodating students with learning difficulties. The thing is, it’s not enough that students are capable of passing classes; any person can pass a class simply by blindly memorising whole essays, notes or equations. Children need to have comprehension of the vital concepts of the subjects taught. My tuition teachers taught me to understand concepts whilst my school teachers simply gave us information to regurgitate at the examination level. Tuition isn’t all good, though. I spent so much time between school and tuition that I had very high stress levels. Between school, tuition and CCAs, I didn’t really have a lot of time to play and be a kid. This has had lasting effects on my adult lifestyle. Even today, I still find it difficult to relax and I have days when I’m simply just terrified of leaving my house because I don’t know what to do once I’m outside. Tuition has strong socioeconomic impacts as well, which The Hexacoto writes about in his blog. On the flip side, the Australian school I went to had smaller class sizes (10-12 students per class) and longer class times (1.5 to 2 hours per class). Extra Curricular Activities are encouraged, but the bulk of them are run by non-school organisations and, outside of an official school choir or band, are not part of a teacher’s workload. This give teachers more time to focus on teaching and also allows them the time to focus on students who are struggling to reach their full potential. I have to admit that individual interest is also a factor in my doing well during the HSC without the need for tuition. Upon entry to the Australian school, I was encouraged to pick my own subjects so long as I did a minimum of 12 credits worth of studies and that I chose at least one form of English and one form of Mathematics from a level anywhere between “general” and “double credits”. A student can, therefore, adjust their workload to match their own interests and needs, without having to first “prove” themselves capable in a series of examinations. It is my belief that a student who is interested in a particular subject will most certainly put in the effort required to excel in that class. Heck, I picked Advanced Japanese as one of my elective subjects despite barely even understanding the alphabet and still managed to do reasonably well in that class simply because I was interested in it. On the flipside, however, Juvenile delinquency is pretty big in Australia, but that’s another post for another time. The MOE says that they will be providing comprehensive levelling-up programs for struggling students and that they will be committed to attracting and developing teachers. I sincerely hope that they are successful in this endeavour because honestly, I’d like to see a future for children in Singapore where tuition isn’t necessary and children get time to be children. Unfortunately, given the way our culture and education is built right now, I don’t really see that happening anytime soon. The Best Movie Trailer of 2013!! Bricks that make me smile. P.S. What do you think about this Ministry of Education press release? It’s about mainstream education in Singapore. Basically, the MOE don’t feel that students require private tuition in order to cope with the current standardised curriculum (and also, they imply that not many teachers leave public service in order to join the tuition service). This seems to be a load of crock to me. What are your thoughts? Okay, so I have been deep inside the Study Caves ™ and Work Mines ™ for the last few weeks and have, sadly, been unable to have a fun night on the town for a long time. Still, in between chapters, I’ve been distracting myself from my studies by doing pseudo work at the immigration counter on the Arstozkan border in East Grestin. 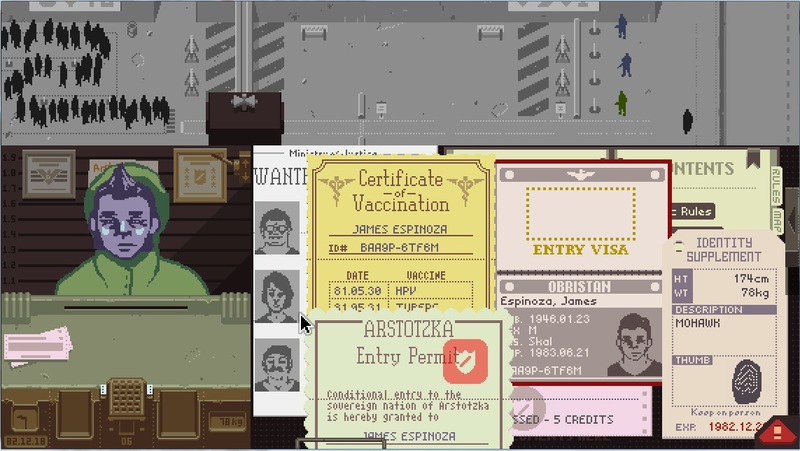 Papers, Please is a surprisingly fun border-immigration-checkpoint simulator made by Dukope and is easily available in downloadable form for the low, low price of $9.99. I caught wind of this game when it was still sitting in the Steam Greenlight community and have wholeheartedly backed its creation. This game has been the darling of reviewers and critics this season and my favourite Canadian geek comedy group, Loading Ready Run, even made a parody video of it. The story of the game is simple. You have been chosen to work the immigration counter on the Arstozkan border in East Grestin. Each day, you read the newspaper, then trudge through the cold snow to your tiny little immigration booth where you must decide whether to let people through the border based on the rules and the papers that they give you. Your family is counting on you to process as many people per day as possible. The more people you process, the more credits you earn, which allows you to pay for things such as food, heat, medicine and better living quarters. Processing a normal immigrant. In no particular order: Wanted Criminal list, Audio transcription of conversation, Rulebook (now with tabs! ), Certificate of Vaccinations, Entry permit, Passport, ID Supplement and Citation. This sounds simple enough, but as time wears on, paperwork starts to build up as different Ministries give you different instructions. The Ministry of Information wants you to confiscate passports and pass on secret documentation, the Ministry of Justice wants you to identify and detain possible criminals, the Ministry of Health needs you to check everyone for proof of vaccinations and so on and so forth. Failure to comply with ANY of these demands will result in the receipt of a citation, which charges a fine for the mistakes you’ve made. This coupled with the cramped workplace you are given, and the dwindling resources you have in your booth results in you having to shuffle papers back and forth as you compare dates, examine document seals and scrutinise everything. 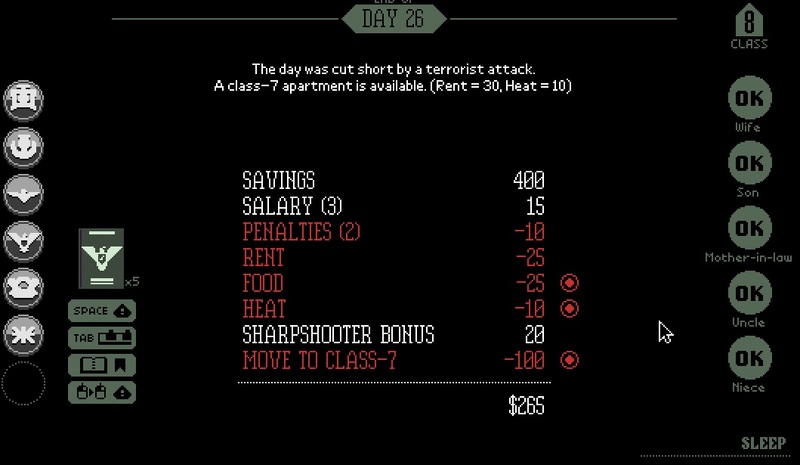 At the peak of paperwork in the game, I was looking at up to eight documents on my little desk at a time. Dukope has a genius way of bringing the cold atmosphere of the heartless bureaucratic world that you live in through the gray tones of the game, but also through simple storytelling. Some immigrants will tell you sob stories in order to get past the border, some will bluster at you and some may attempt bribery. Despite your family being represented by little grey circles at the end of each day, you genuinely come to care for them and want them all to show an OK signal. Simple touches like your son drawing a picture of you in crayon makes you want to ensure their safety. This makes visits from the Ministry of Information all the more dangerous, since they always seem to imply that this family will be put in danger should you get caught helping others get over the border. The game is surprisingly addictive and extremely fun. It’s definitely a good example of what one can produce on a shoestring budget. This game will improve your life. 1. Tired owlets are cranky. 2. Cranky owlets are Loud. 3. I do not like Loud. 4. The general public generally frowns upon Loud. Generally. These reasons have prevented me from taking the kids out to various nocturnal events such as Chinese ten course wedding dinners, wine tastings, classical music concerts and pub quiz nights. 1. The activities do not require absolute silence lasting more than a few minutes at a time. 2. We can leave at any time without feeling guilty or disappointed. 3. The owlets have had an appropriate level of daytime rest. 4. The owlets have demonstrated an exceptional level of good behaviour throughout the day. Bearing all these criteria in mind, I decided to take the owlets to the Singapore Night Festival. The activities at the Singapore Night Festival take place from 7pm onwards at several locations in the centre of the city, so there is plenty to see if the kids still need to get home for an early night. We got to Fort Canning Park fairly early, so there was still (FREE) parking at the outdoor public carpark. We walked across the top of Fort Canning hill, and headed for the National Museum of Singapore, getting there just in time to watch the Circus Swingapore performance at 7:30pm. J and Little E were absolutely mesmerised by the aerialists, and I had the pleasure of telling them that their very own Ee Ee Becky learned both the lyra and the static trapeze. 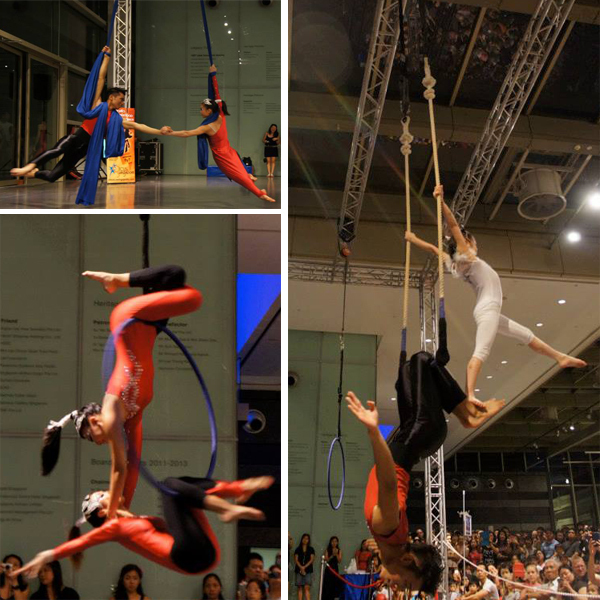 Some of the aerialists were little girls of around 10 to 12 years of age, dressed in spangly white leotards and tights. They looked like little snowflakes. That was J’s favourite part of the performance. Why should eggs and pancakes be reserved for morning consumption? 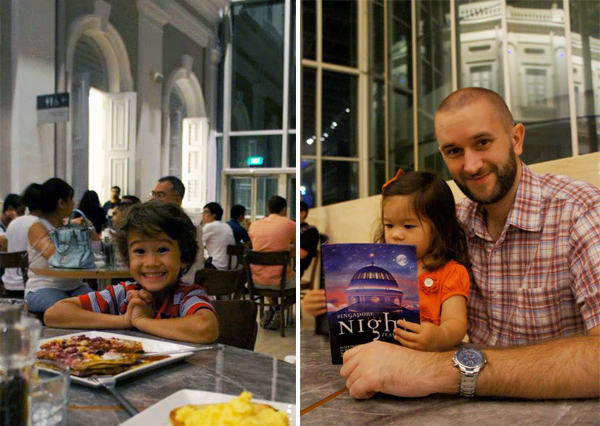 Afterwards, we headed downstairs to Food For Thought, and had pancakes and eggs for dinner. The children had a gula melaka soaked pancake each, topped with mixed berries and thick coconut vanilla cream. It is as delicious as it sounds. We did attempt to head outside the National Museum in order to take part in other activities around the Bras Basah area, but it was starting to get very crowded (people were queuing up to get into the Absolut Canvas exhibit which had a pop-up bar), so after jostling with the crowd for half an hour, we gave it up and headed for the car. 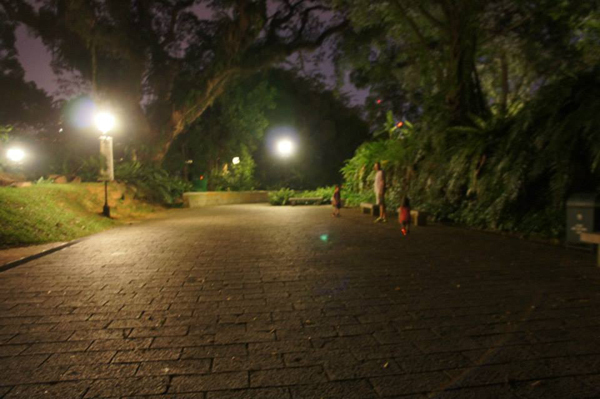 All was not lost, however – we played hide-and-seek at the top of Fort Canning Hill, running zig-zag through the trees, round and round the Fort Gate and the spice garden, hooting to each other. The best part: we still managed to get the children in bed by 9:30pm. Which left us grownups with some quiet time to ourselves! Heehee! P.S. When J gets old enough to get one of Droo’s custom-made violin bows, maybe we can think of busking at night during the Singapore Night Festival! That would be awesome. As far as I’m concerned, people aren’t meant to live alone in boxes and if you’re single like I am, having a pet is a nice way to have some companionship in your house. Pets are great at listening to your woes and super awesome for cuddling. I share my bachelor burrow with a pair of super adorable fancy rats, Alarum and Nimhe, so I thought I’d introduce them. Alarum, the cinnamon hooded single rex rat, is the big girl of the cage and is so named because the pattern of her hood forms an exclamation point when she’s stretched out. She was born and bred at Iced Mice Rodentry and comes with her very own pedigree – her parents being champion rats in their own right. 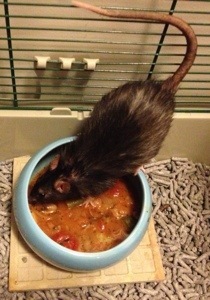 Alarum is a fat, fluffy little rat with a cuddly personality reminiscent of a friendly dog. She loves giving kisses and licks, and can sit in my hand for hours “grooming” my fingers. Alarum is trained to sit on my shoulder and ride when I go out to town. She loves sitting inside the front pocket of my hoodie and getting stroked while she watches the world go by. She’s also a one-time mother, having had a litter of 16 babies. Nimhe, on the other hand, is a sleek, black silk varigated berkshire rat with pretty, glossy fur. She’s more skittish and energetic than Alarum, so she loves playtime much more. She especially loves leaping onto and off things. Nimhe isn’t shoulder trained like Alarum is and tends to be more shy with strangers. I play with her at home and keep her in the cage most of the time. She’s learned more tricks than Alarum has and spends hours running in the wodent wheel that I bought her. Despite being smaller in size, Nimhe is older and more sickly than Alarum. She’s also always sneezing and snuffling, something which I need to keep an eye on as most Australian fancy rats have mycoplasmosis, a disease that targets the rat’s lungs. The relatively small gene pool for rats in Australia means that mycoplasmosis can’t be bred out of the rats, as it’s passed on from mother to baby. While most breeders have managed to at least breed rats that are at least semi-resistant to myco, Nimhe was purchased from a breeder of some ill repute. 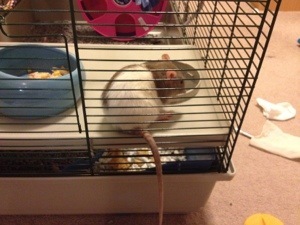 She’s also the first rat I have ever purchased. Nimhe’s been very ill lately, so I’m not very sure how much longer she has to live. So there you have it, my miniature family in Sydney. I’ve been given to understand that J is convinced that he’ll get a special Lightsaber bow for his violin if he becomes good at it. I see no reason why he shouldn’t have one, so I’ve consulted my friend Droo about the construction of such a bow. Now, Droo isn’t just any engineer. Droo is the engineer. He is descended from a long line of engineers that I’m almost sure dates back to the design and construction of the Pyramids . Droo’s original design for the lightsaber bow involved using some sort of lightbulb cabled to the back of the bow by means unknown to mundane folk like myself. The bulb would be bright and use up very little energy, but the weight of the bow would be far too heavy to J to lift. Plus, we soon discovered that violin bows need to be able to bend, something that such a bulb could not do. The vibrations of the music might also cause the glass to shatter, which would not be safe. The second design was an idea I came up with. Droo had purchased a roll of lights for sticking up around his house so that he could find his room at night. The lights wouldn’t exactly give a clean, singular light like in the video, but it would have the same effect as fairy lights – besides which, they could also be programmed to blink, or change colours. However, the lights were also fairly energy intensive and needed a large battery pack. We briefly considered using a paper battery as the power source for the thing, but such things haven’t quite hit the common market yet and would blow our budget right out of the water. Droo’s latest design, and one that I have the greatest hope for, is based on the Ben Kokes light up engagement ring. Check it out. Since the bow needs to bend, we’re probably not going to use copper or a string of LEDs, though. Uncle T has suggested finely sanded fibre optic lights, so as not to injure J’s eyes. We’ll make a little bracelet for J to wear when playing his violin that contains the transmitter. We’re still working on the whole weight/largeness issue. I expect we should be finished with this particular project before J turns six. Not the Sphinx, of course. The construction of that thing was taken over halfway by shoddy contractors.